` If you had weather like we did in the Southeast you saw a fantastic Memorial Day weekend. It was swimming pool weather for sure. Time to put the sunscreen on the kids and blow up the pool floats. Many of our early bird clients are already swimming in their new pools. They were able to get an early start to the pool loan and pool building process and are now enjoying their backyard oasis. If you were unsure if you wanted to build a pool this year and have just finalized your decision it is definitely not too late to get started. Many pool installs can take just a matter of a few weeks for an above ground pool and just a little longer for more in depth in ground pool projects. Start calling around to some local pool contractors and get an estimate of the cost of the pool and also their expected turn time on getting your pool installed. Many of you in the northern parts of the country can still time this with your kids getting out of school and plan a wonderful summer of fun for you and your family. Pools are great gathering spots for extended families and you will not have a shortage of guest that will want to enjoy the spoils of your new backyard paradise. 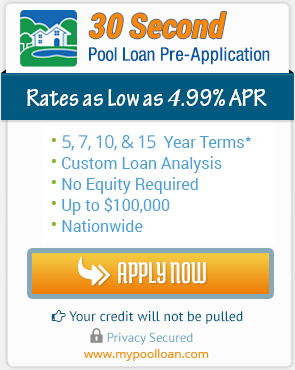 If you are thinking of getting a pool this summer now is the time to get started. We are happy to help you with your loan if you need one. Happy and safe swimming to you and your family.